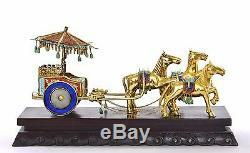 Vintage Chinese Gilt Silver Enamel & Hardstone (NOT JADE) Horse Drawn Carriage on Wood Stand. It is 6.2 inches (16 cm) tall by 11.5 inches (29.2 cm) in length by 4.25 inches (10.7 cm) wide (all measured with stand). It weighs 2.5 lb. There might be a stone missing at the top of the umbrella. The stones have flea bite chips and inclusions. There are missing enamels and the enameling has stress cracks, stains, and small bruises (as seen in the photos). The carriage is attached to the wood stand with screws. The wood stand's bottom has holes drilled for the screws. How we pack your item is at our discretion. The item "Chinese Gilt Silver Enamel HardStone NOT JADE Horse Carriage Rickshaw Wood Stand" is in sale since Tuesday, June 27, 2017. This item is in the category "Collectibles\Cultures & Ethnicities\Asian\1900-Now\Chinese\Other Chinese Collectibles".